Gurgaon: German luxury car maker BMW on Thursday launched its pre-owned car business in the country that can make customers own a product of the brand for as low as ₹ 16 lakh. “Till October this year we have sold a total of 8,042 cars in India, accounting for 40% of the luxury car market. With the BMW Premium Selection, we are looking to enhance position," BMW India president Andreas Schaaf told reporters here. The pre-owned car business will play an important role in the success of the company in India, he added. “We expect the used car business to be about 10% of new car sales," he said. Asked how much would be the price differential between the new and used BMWs, Schaaf said : “For example, a 3Series sedan with three years of usage, can be available for up to ₹ 16 lakh as against ₹ 24 lakh for a brand new one." 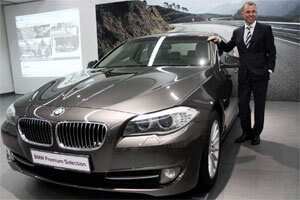 He said pre-owned BMWs will be available in seven exclusive BMW Premium Selection dealerships across the country. “The number of dealerships will be increased gradually as we go along in the next one to one-half years," he said. In order to push sales, BMW is offering 13% finance rate on purchase of its pre-owned cars through its financial services arm -- BMW Financial Services. “These cars are less than five years and would have clocked under 120,000 kms," he said adding the company is offering warranty of 24 months or up to 200,000 kms whichever is earlier. Commenting on the market condition, Schaaf said the luxury segment was growing well till October. “Since then it is getting much more difficult and the market has changed. We had set a target of selling 10,000 units this year, which is becoming difficult now." BMW’s rival Mercedes had already forayed into the used car market last year with ‘Proven Exclusivity´.